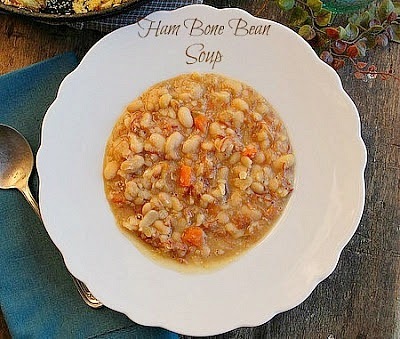 A hearty bean soup made with a ham bone that will warm you and fill your belly in the midst of Winter. In all my years of cooking one of the things I never got around to making was homemade ham and bean soup. I can't explain why I wasn't interested, it just never got made. That changed quickly. I am very blessed to know bloggers that are excellent cooks. 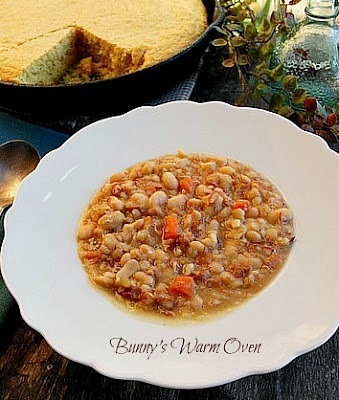 Mary, a southern blogger whose blog is called Deep South Dish, posted this recipe on her blog and her Face Book recipe sharing page called...Best Southern Recipes From The Deep South. What's a Facebook recipe sharing page? It's a place where bloggers go to share their recipes, people like Mary so graciously spend their time and energy helping bloggers get their blog posts to the public. It just so happened that at the time I saw Mary's Old School Ham Bone Bean recipe, I had a spiral ham in the fridge. It was evening when I decided to make her recipe. I decided my best choice would be to cook the ham bone in the crockpot overnight. I put the ham bone with lots of meat on it and the stock ingredients along with the water amount in the crockpot and let it do it's work. In the morning I awoke to the wonderful aroma of stock simmering. The broth was a gorgeous color, I knew it was going to be rich in flavor. The meat had simmered completely off the bone, I strained the broth , I put the broth back into the crockpot and saved the strained stock ingredients and meat to add back into the soup later. My husband believe it or not, has more experience cooking dried beans than I do. He suggested I add the bag of Great Northern Dried Beans to the broth and let it cook in the crockpot until they get soft, this took about 3 or 4 hours. That way the beans have the stock flavor. After the beans had become soft I took one of my mother's suggestions and mashed the beans with a potato masher to help thicken the stock. It worked beautifully. I then added the strained stock ingredients, plus the ham meat back into the crockpot to the mix. 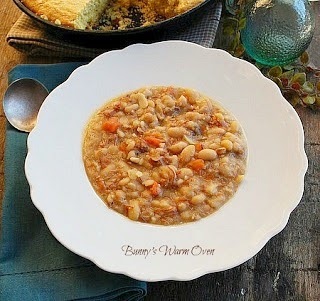 How did my husband feel about my first attempt at Old School Ham Bone Bean Soup...He loved it! He said it was perfect! He didn't even want me to freeze any of it, he said he'd eat it during the week for lunch! Thank you Mary for the perfect Old School Ham Bone Beans recipe!!! Thank you Mary! Your post made me hungry for beans!! I made this recipe yesterday following the crockpot method you described. I had a 13 pound spiral-cut ham at Christmas & used the meaty bone. It turned out wonderful. My husband & son kept saying how good it was as they ate. Only thing, I had too much broth & removed 4 cups before finishing the soup. (I have a large crockpot) Usually I make ham & bean soup on top of the stove but I'm going to use the crockpot from now on. Happy New Year to you & your family! Thank you Mary! You and your recipe were my inspiration to try it! Tricia wasn't the aroma while cooking wonderful!! My husband loved it too, as far as I'm concerned it's the best way to make soup! The broth is so rich and full of flavor. I froze some of the soup, what a great way to be economical as well. Thank you for coming by to tell me you made it! I forgot to say that I froze the 4 cups of broth to use for my next batch. We had the rest of the soup today for dinner with corn bread.